Okay, yes, the title of this post is a bit weird. But so is OCD, so deal with it! Over this past year, I have had a problem with eating finger foods—or really, any food that requires my hands to come close to my mouth. If my fingers touch my mouth or lips, I feel like I have “contaminated” my hands and the compulsion arises to wash my hands before I touch or do anything else. At movie theaters, this problem flares up when popcorn or other small candy gets involved. I try extremely hard to pick up the popcorn or candy in such a way that I can still eat it without my fingers touching my lips. It requires concentration and precision. This is not always easy in a dark movie theater when you should be concentrating on the film (rather than how you are holding a popcorn kernel). When mistakes occurred and I couldn’t readily wash my hands (I didn’t want to miss the movie, after all), I would usually hold my hand out on the arm rest or on my lap with the palm and fingers up (so as not to touch the seat or arm rest with my “dirty” fingers). It got kind of weird. This obsession to keep my fingers clean has also led to problems with eating sandwiches or tacos at restaurants. I get nervous around the end of the meal—those last few bites where you have to have your hands and mouth pretty darn close together. I tend to rush through eating and finish it up really quickly or with a big bite at the end. Awkward. 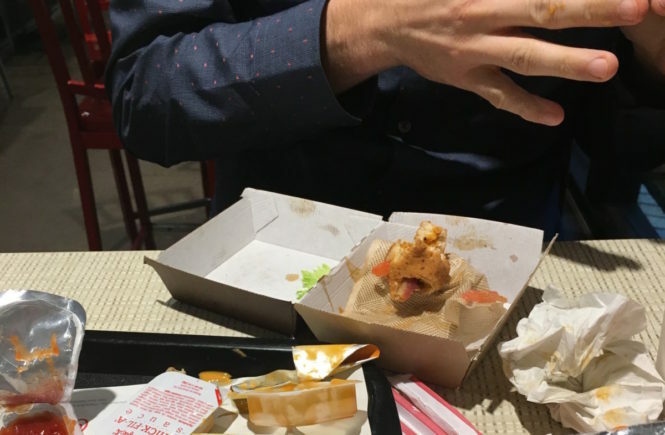 The other night my husband and I went on a fast food dinner date. I had a spicy chicken sandwich, and the end was coming close. It was dripping sauce all over (and was delicious), but I told my husband my concerns. He challenged me to face my obsessions, eat the sandwich, and even wipe some of the dripped sauce up with my finger and lick it clean. We were planning on going shopping afterwards to Nordstrom Rack. I was horrified! How could I touch clothes with a contaminated finger? But you know what? I knew that I needed to write a “sketch” and that this would be a great exposure. So I did it. I did it! And it wasn’t the end of the world. Yes, I felt uncomfortable, especially as I was shopping—but that’s the point. That’s what we have to do to get and stay better. What challenges have you given yourself lately? ← Is a diagnosis important?